PATIENT: A 60-year-old female with horizontal and vertical bone defects, which required comprehensive augmentative measures. ​CHALLENGE: All of the patient’s natural teeth, which serve as abutment teeth for a telescopic restoration, could not be preserved and thus were extracted. 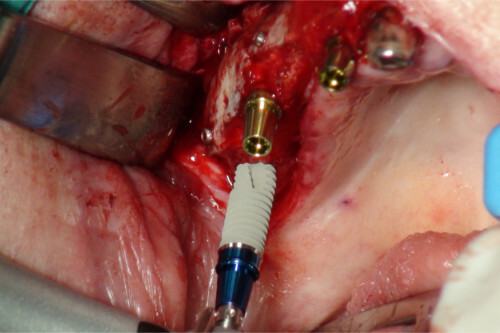 In this case, a concept for bone grafting and prosthetic rehabilitation is required, which offers maximum stability and good long-term results. TREATMENT: The surgical treatment consisted of three procedures, each at three-month intervals. 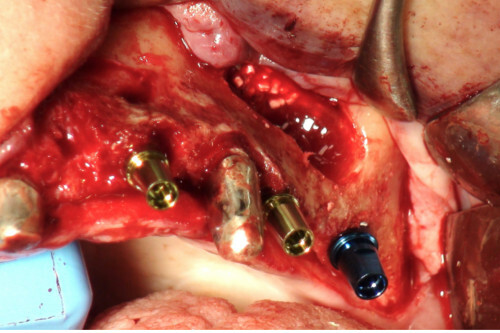 After harvesting a bone block from the retromolar region of the right mandible with FRIOS MicroSaw, the previously augmented area was opened and six XiVE implants were inserted. Afterwards, the final prosthetic restoration (ATLANTIS) was then carried out based on the stability of the primary splinting of the implants. 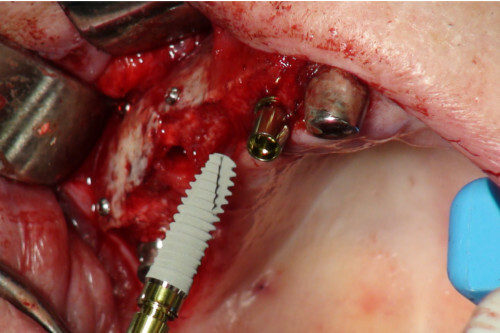 Autogenous bone block grafts, bone grafting material or a combination of both procedures can be used to restore an implant site of adequate dimensions in an atrophied maxilla. 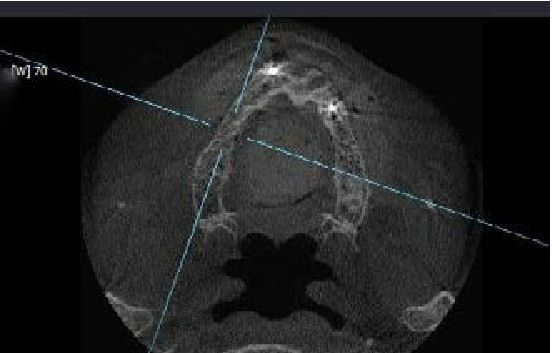 If the vertical height of the bone is inadequate in the posterior region, a sinus floor elevation is often indicated to safely stabilize the implants. 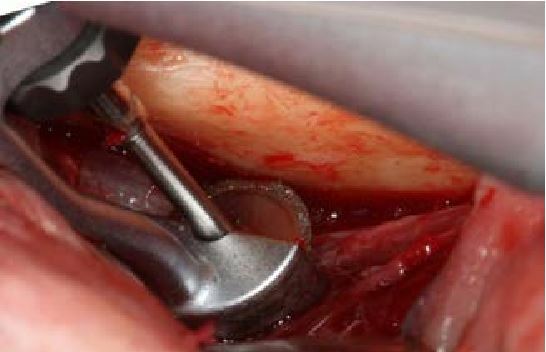 In the case presented here, surgical treatment based on the “biological concept” according to Prof. Khoury [1,2] and a combination of autogenous bone block grafts and particulated bone chips is depicted. The case also describes the “layer principle” as part of a sinus floor elevation in conjunction with bone grafting material. The objective of the treatment is a restoration with longterm stability and a good esthetic result. 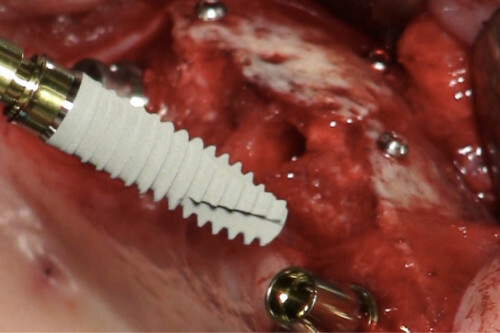 An implant-supported bar-latch design based on the prosthetic concept of Dr. Pape (Schellenstein concept) is planned . The 60-year-old patient was referred to the practice with a telescopic restoration on natural abutment teeth 11, 21, 22 and 23. Crown and bridge restorations were used in the mandible; however, teeth 21 and 22 could not be preserved and were extracted. Abutment teeth 11 and 23 could not be preserved, but served as abutments for the temporary restoration until fabrication of the final prosthetic restoration. 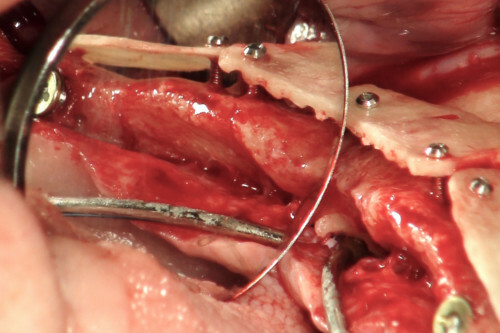 In the premolar region specifically, pronounced horizontal and vertical bone defects that required comprehensive augmentative measures were identified in the preoperative three-dimensional DVT imaging (Fig. 1 to 4). (Fig. 9 and 10) for position stability. FIG. 7 The thinned bone block set at a distance. The area is prepared for filling with particulate autogenous bone chips. 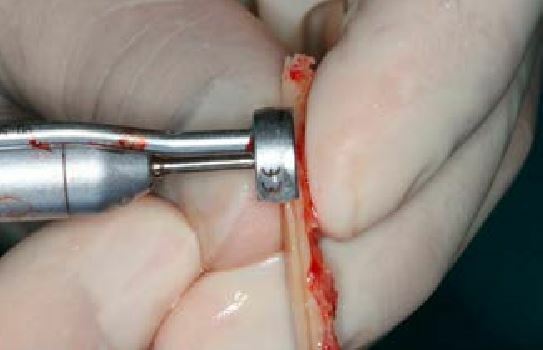 A mucoperiosteal flap was used for soft tissue coverage in which the periosteum was slit to ensure tension-free closure over the grafted bone. 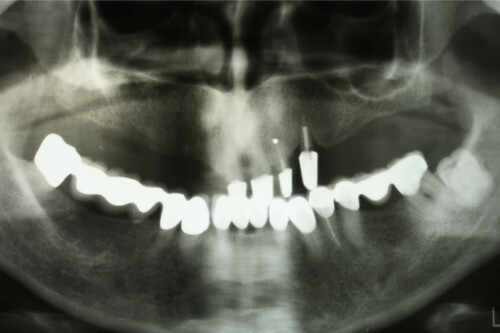 In the course of this first procedure, four XiVE implants (DENTSPLY Implants) were inserted in regions 12, 22, 24 and 26 (Fig. 11). After three months, as a part of the second surgical procedure, the previously augmented area was opened. The site appeared well-regenerated and vascularized. 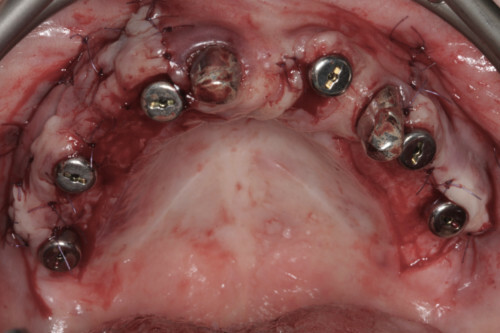 In this procedure, two additional XiVE implants (DENTSPLY Implants) in regions 14 and 16 were inserted, making a total of six implants available with uniform abutment distribution in the maxilla as a basis for later prosthetic restoration (Fig. 12 to 15). After another three-month healing phase, the last surgical procedure exposed the implants by means of an apical sliding flap. The natural mucogingival junction was then restored and the gingiva formers inserted (Fig. 16, 17 and 18). 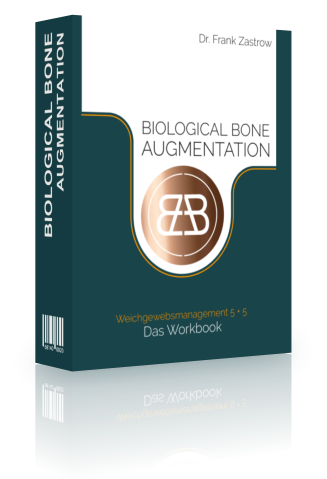 Soon available your FREE EBOOK "Soft tissue management 5 + 5" ! 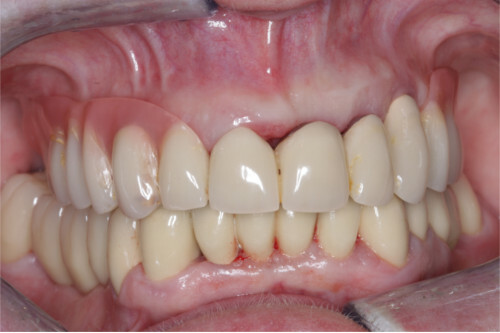 The soft tissue took three weeks to heal around the gingiva formers. Following the prosthetic treatment phase, four appointments were necessary for completion of the final restoration based on the prosthetic concept of Dr. Pape (3). 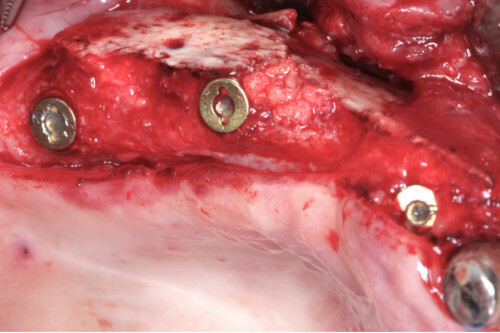 In the first session, an impression was taken in the reposition technique wherein transfer copings were inserted in the implants (closed-tray impression) and an initial impression taken with a stock tray (Fig. 19). This impression was used in the laboratory to fabricate an initial cast and to prepare a secondary impression using the Pick-Up technique. The impression posts were rigidly attached to the cast using Pattern Resin (GC, Bad Homburg). 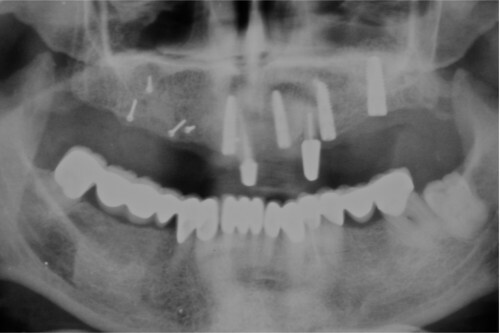 This index was separated again between the implants in the laboratory and the impression posts placed in the mouth of the patient in the second session (Fig. 20). The separation gaps were reconnected intraorally with Pattern Resin to ensure high precision in the second impression (Impregum, 3M Espe, Seefeld) by stiffening of the posts (open impression with custom tray). 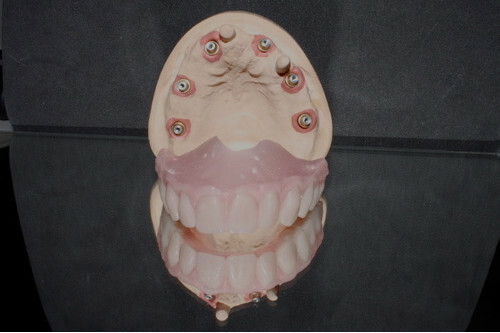 In the laboratory, a master cast with gingival mask was fabricated and a tooth set-up prepared for “esthetic try-in” (Fig. 21). FIG. 20 Preparation of the secondary impression. Impression posts splinted with Pattern Resin. 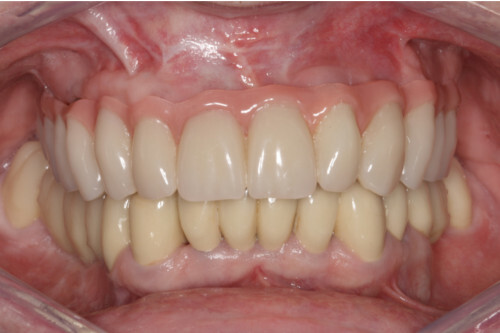 In the third prosthetic session, the wax try-in or “esthetic try-in” was carried out on the patient. The master cast, related counter bite and tooth template were sent to the central fabrication center in Hasselt, Belgium for fabrication of CAD/CAM frameworks (ATLANTIS ISUS, DENTSPLY Implants). The dental technician can use the free ATLANTIS ISUS Viewer software in the laboratory to review in three dimensions and finalize the digital concept of the bar design proposed by the milling center. The bar was then milled out of cobalt-chrome in the fabrication center and the restoration shipped to the dentist’s private laboratory. Thanks to the precision of impression and industrial fabrication, the bar framework exhibited an absolutely tension-free fit and served as the basis for fabricating the final superstructure in the laboratory. 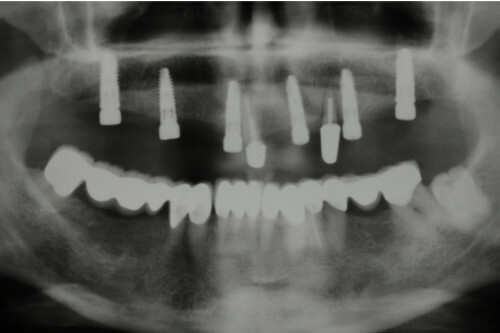 In the final session, before positioning the finished restoration, the fit of the bar in the mouth of the patient was checked using the so-called “Sheffield Test.” The fit of the bar again appeared tension-free, allowing it to be permanently screwed to the implants (Fig. 22 to 24). 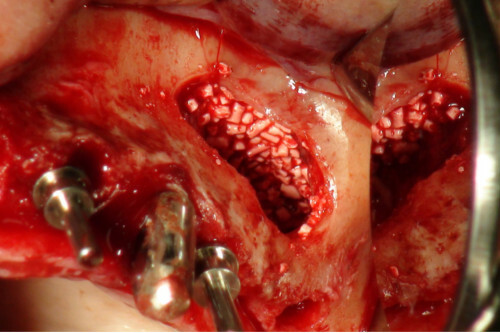 The primary splinting of the implants by the bar gives the restoration great stability in the augmented bone in particular. 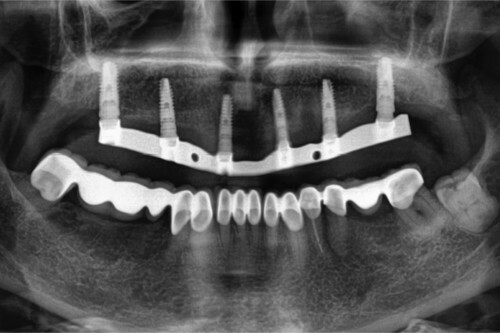 Due to the uniform distribution of the implants in the ridge and creation of a large support polygon, good force distribution across the implants is possible, which in turn achieves a good long-term result. 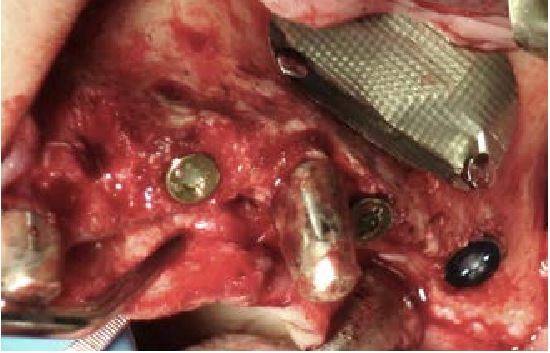 Because the bar construction is screw-retained, the risk of leaving excess cement in the peri-implant region, which represents a risk of peri-implantitis that should not be underestimated according to latest studies, is avoided (4). 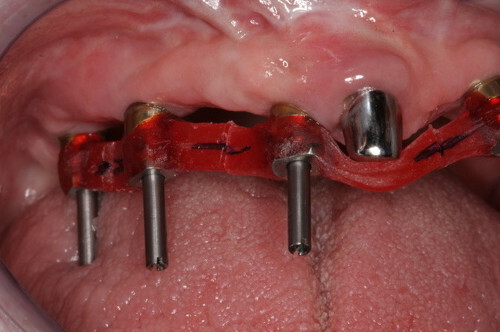 The removable palate-free prosthesis is provided with latches (MK1 latch) on both sides to “firmly” anchor the prosthesis to the bar. The latches counteract pull-off forces and prevent abrasive wear on the bar when the cuspid guide is set and resulting friction loss of the bar-latch design (Fig. 25 and 26). Due to primary splinting of the implants with a bar construction and the large support polygon created, maximum stability is achieved directly in the augmented bone. In the atrophied maxilla, the phenomenon is often observed that the maxilla is smaller than the mandible due to its centripetal shrinkage. 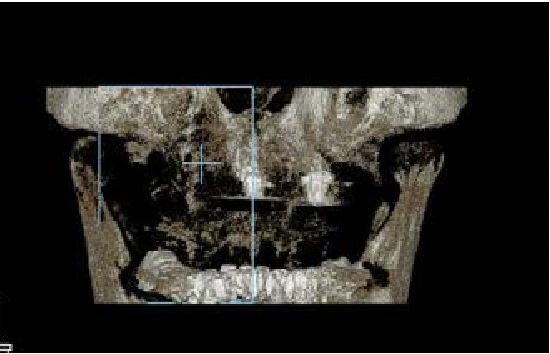 The advantage of the bar restoration over a telescopic restoration, with regards to this problem, is the decoupling of tooth and implant position. 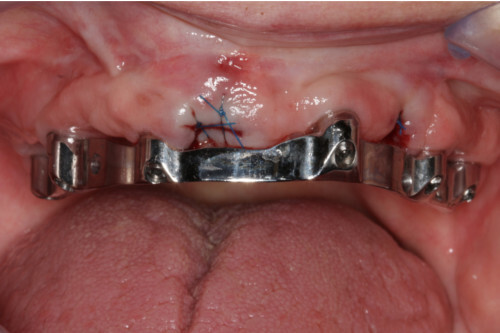 The bar can be placed in front of the alveolar ridge and, despite an unfavorable initial situation, still achieve good occlusion and lip support.The bilateral latches are also beneficial for this restoration as they give the patient a feeling of security because he has direct control of anchoring the restoration. In addition, hygiene access is not affected in any way because the restoration is removable. 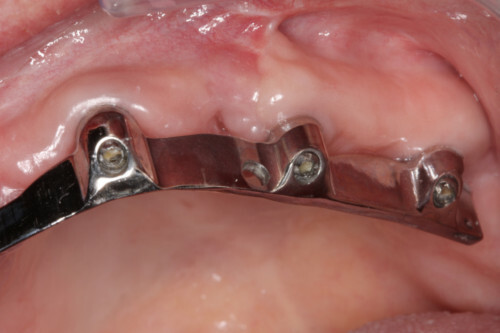 In this way, the use of latches takes into account the patient’s desire for a “fixed” restoration and the requirement for long-term stability, which is the basis of the easy-toclean design. The removable restoration also allows quick and easy repairs and chipping is never an issue because ceramics are not used. Unlike a fixed restoration, no esthetically or phonetically compromising cleaning channels are required. 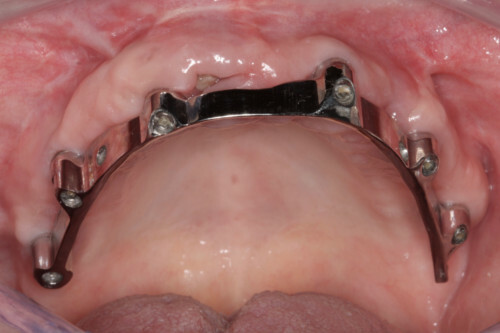 The cleaning channels of fixed implant bridges often make it difficult for patients to form the “s” sound. This can bring into question the success of the entire restoration because it can make the patient feel uncomfortable and insecure due to limited language capability. In contrast, the restoration presented here does not affect phonetics or pronunciation by the buccal plate. The final restoration exhibits a functional, esthetically pleasing, and phonetically unimpairing result that also meets the wishes of the patient. 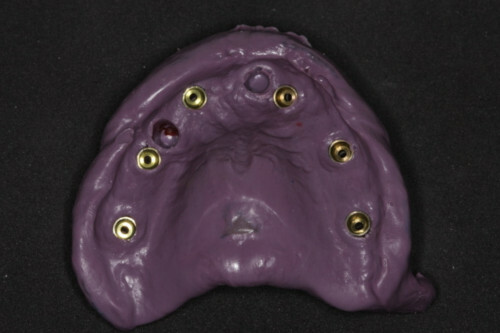 Therefore, this treatment concept is a good option for restoration of the edentulous atrophied maxilla.